Memory is the processes that is used to acquire, retain, and later retrieve information. The first stage of memory is encoding. Encoding is the process of getting information into memory. It occurs when information is translated into a form that can be processed mentally. Information from the environment is constantly reaching your senses in the forms of stimuli. Encoding allows you to change that stimuli so you may put it into your memory. If information or stimuli never gets encoded, it will never be remembered. Information or stimuli has to be paid attention to in order to be encoded. Thus, attention is a significant part of the memory process. The process of remembering begins with attention. Attention is the ability to focus on an event, object, person, or task. If you do not pay attention to the information, it will not get encoded and thus you will not be able to remember it at a later time. Generally, if you have difficulty paying attention, you will likely have difficulty remembering information. The opposite is also true, in that if you pay attention and focus, you will be able to remember information easier. People often will forget the name of someone they met just a few minutes earlier. This is usually because the name never gets encoded. 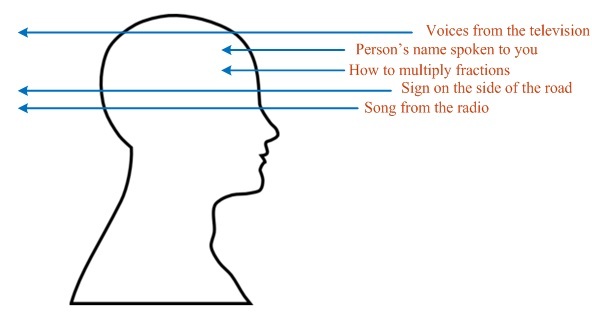 People are often thinking of something else, when they are introduced to the person, and they never encode the name. Typically, the environment around you has too much stimuli for you to encode all that is happening. Therefore, you attend to some information in your environment and you ignore other information. Sustained attention is when you focus on one specific task without being distracted, so most of the information is encoded. Selective attention allows you to select what to focus on while filtering out distractions. This also allows you to encode the information you feel is important. 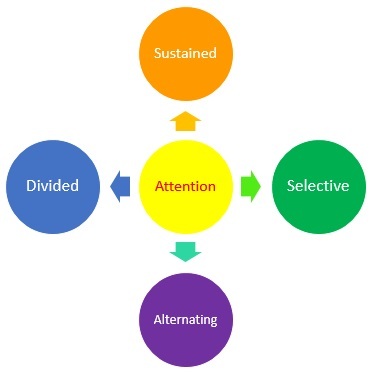 Divided attention and alternating attention occurs when you are paying attention to more than one thing at the same time, thus not encoding all the information.